“There’s an Einstein!” our guide Hayley called out, referring to the mother and two cubs (mc2, get it?) a few hundred metres away. 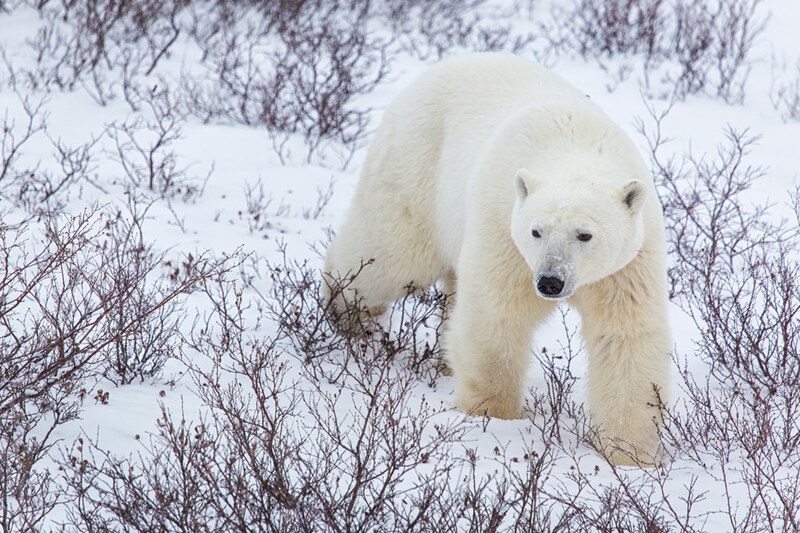 Polar bears, despite what I had expected, are actually quite easy to spot on the open tundra. 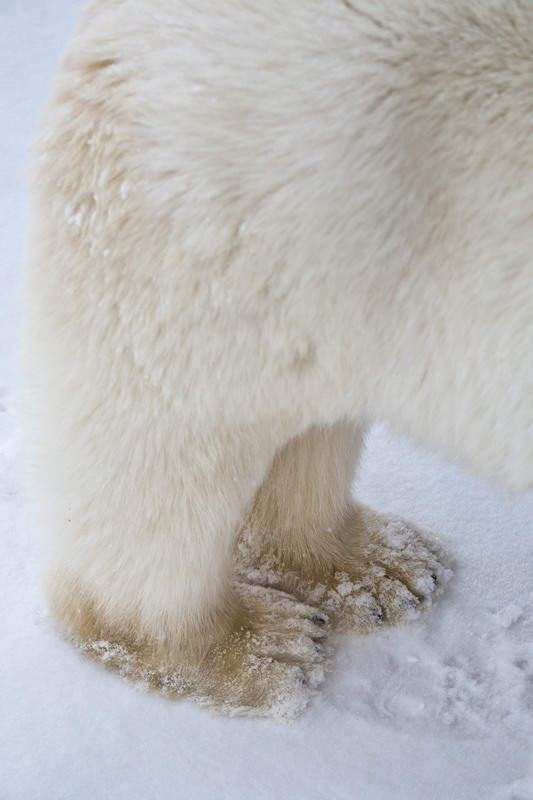 Their ivory fur stands out sharply against the white landscape. They sat curled up together, appearing as one giant bundle of fur with three heads. They, like most of the other bears we encountered, were napping to conserve their energy. It had been many months since having a proper feast, and the upcoming hunt for seals would require all the strength they have in store. Hayley then anxiously pointed out the male approaching them. 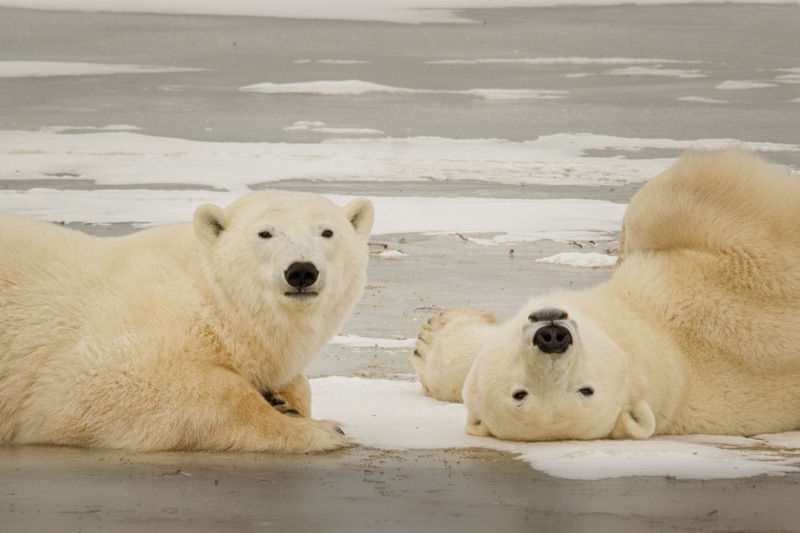 Polar bears will turn on each other in hunger. Even if those cubs were his spawn, that hungry male would not stop from eating them. He was getting dangerously close. The mother, being downwind, couldn’t smell him and her head was turned the other way. My instincts clawed at me to open a window and scream in warning, but instead my hands flew up to my mouth and covered it. Our tour group all stood silent, waiting, staring, willing the mother to notice his advance. He seemed to get so close until she finally noticed and prodded her cubs into action. As they began to put distance between themselves and danger, the male gave up his pursuit. He deemed it unworthy of the energy required to chase, and was probably smart to do so. 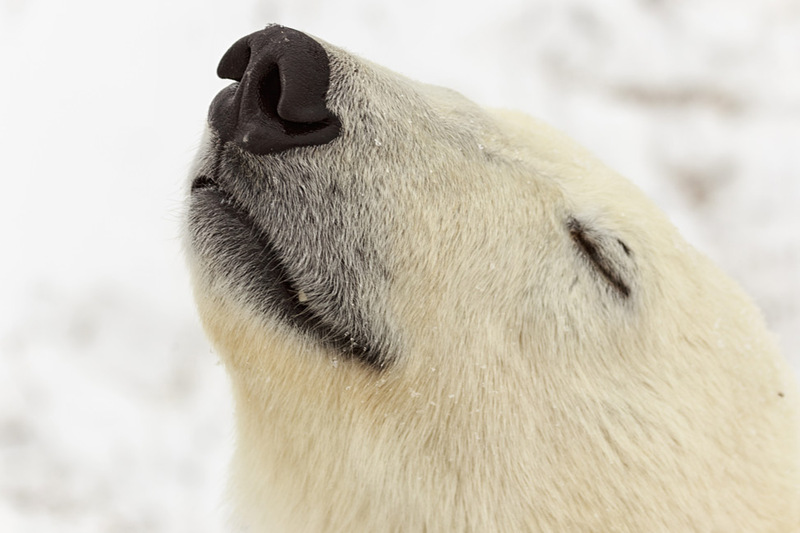 Female bears are less likely to overheat than males, giving her a distinct advantage on that unseasonably warm day. My instincts clawed at me to open a window and scream, but instead my hands flew up to my mouth and covered it. It used to be that hunting was the greatest threat to these icons of the Arctic. Now, it’s changes in the climate. Although often accompanied by a sharp wind, we were surprised at the moderate temperature during our visit in late November. -10C was the coldest it got during the day and the sun surprised us often. Our tour was one of the last for the season and on arrival we could spot why. 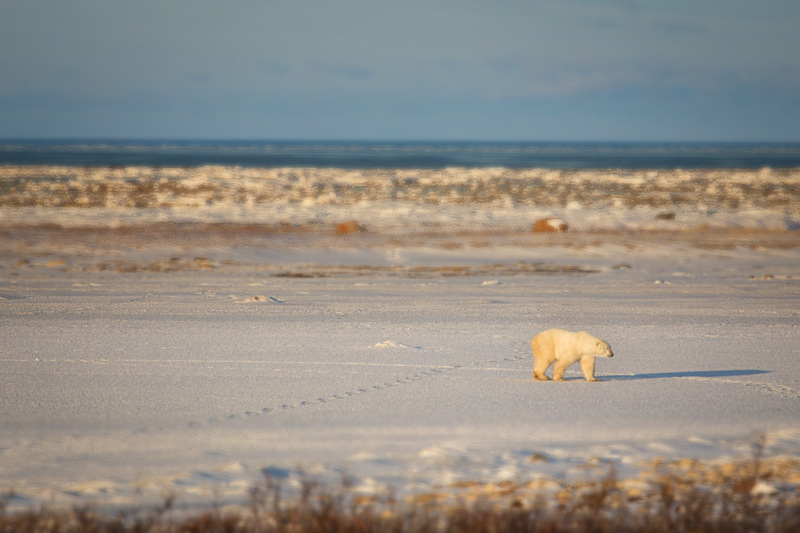 With ice starting to form on the edge of the Hudson’s Bay, soon the bears would be able to venture out onto it entirely and begin the annual seal hunt. But then the day after our arrival, a fierce wind blew all of the ice off the water. The freezing process would have to begin again, and the bears would remain hungry for a few extra days. 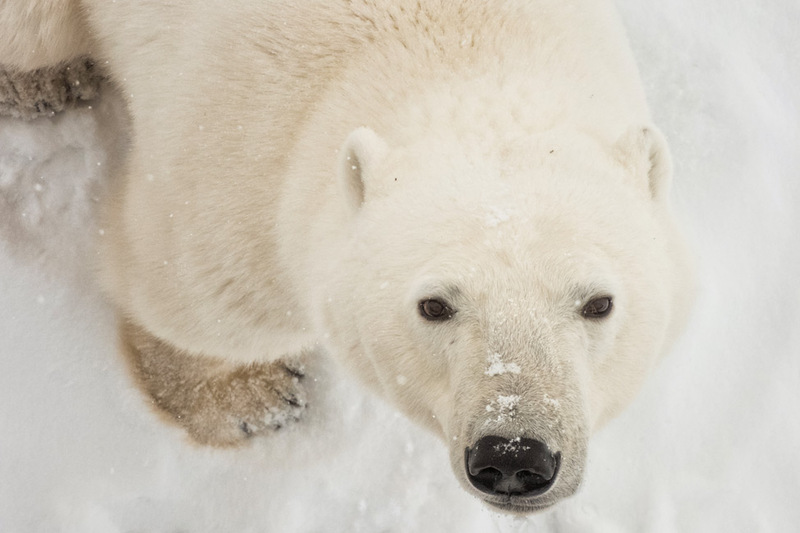 Although estimates are difficult to get, as polar bears live in remote areas that are difficult or expensive to get to, the current total number is roughly 26,000. And one of the most closely studied populations is this one near Churchill – where 22% of that population has declined since the 1980s and we were told that a new report soon to be released states it has dropped even further. Fewer young are surviving and fewer older bears are present – they are not living as long as they used to. 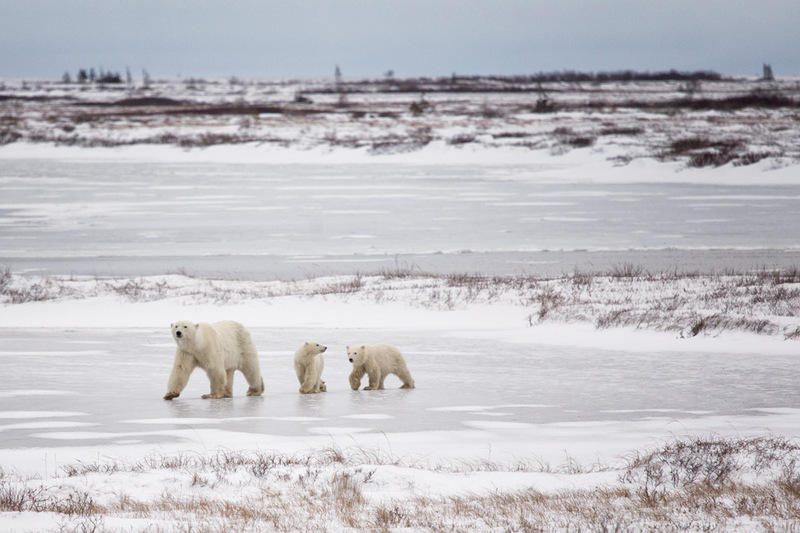 These bears are vulnerable, as are many species in the Churchill area. As the climate changes all around, red foxes are beginning to creep north,battling and dominating Arctic foxes, while snow geese are moving south. 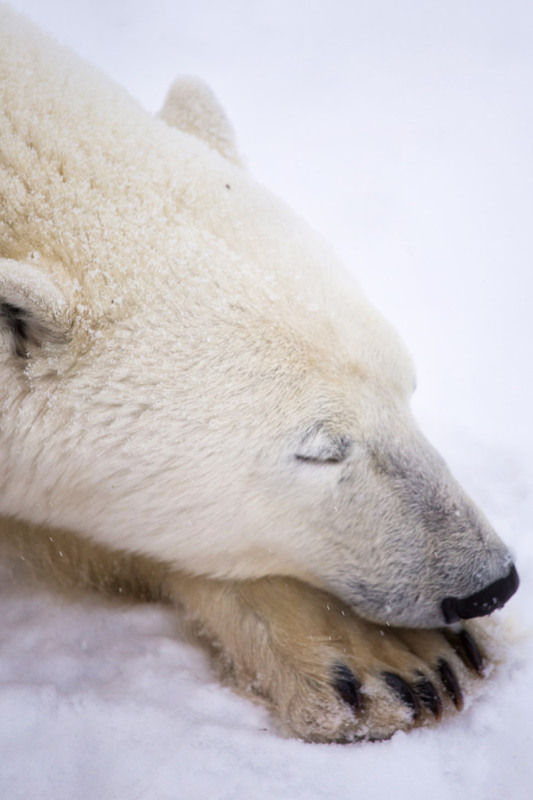 Despite knowing their grievous plight, in real life it is easy to believe that polar bears just want nothing more than snuggles.They aren’t aggressive or territorial like other bears. They make no sound except for slight gripes to each other, and several approached our buggy with what appeared to be only genuine curiosity. A young pair, brother and sister, pushed their pivoting noses up against the heavy steel grill that lined the open back floor. As much as we were instructed to be quiet, we all let out tiny gasps of delight and shuffled about to get a closer look. I crouched low to hear and feel their breath. There was no growl, no baring of teeth. Neither of them gave off any hint of offense and I wanted so badly to reach my fingers down and feel their leathery noses. I knew, however, that either of those bears, or any of them really, would swipe and snap at any exposed part of my body given the opportunity. And it wouldn’t be due to anger or their feeling attacked, but just because they wanted to eat me. I thought about how it had been several months since they feasted on their desired seal blubber and kept my fingers to myself. They withdrew, peered up at us conspicuously, jumped and stretched up the side of the buggy for a closer look, settled back down, and then wandered off. 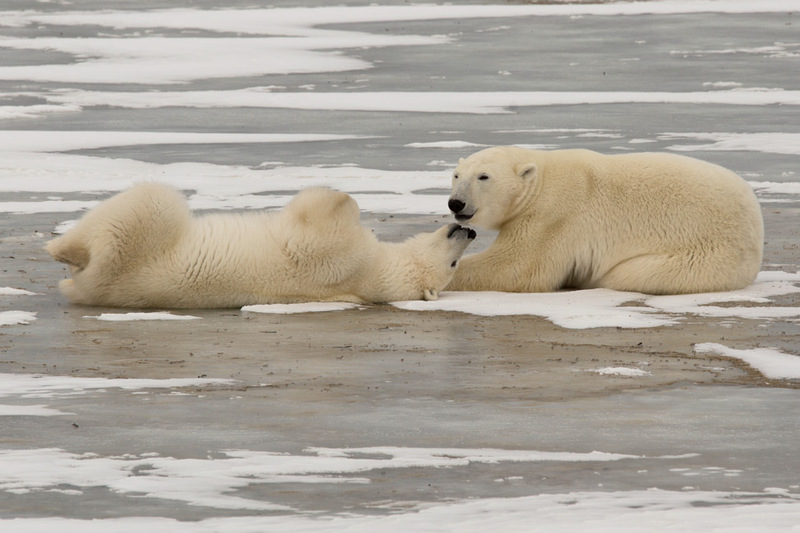 While we ate our lunch from safely within, the pair rolled around luxuriously on the nearby ice. They did so without a care in the world, so it seemed, gently swatting and nibbling at each other. 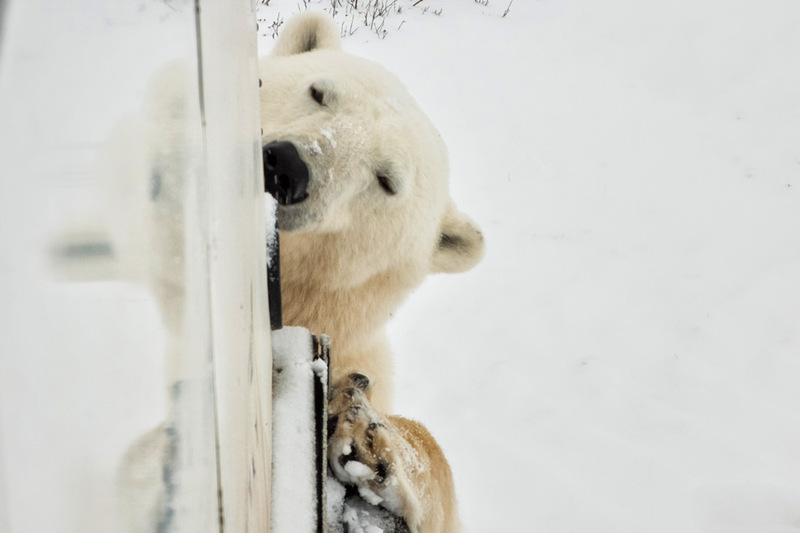 It was an unexpected spectacle of loving play, and once again any vision I had of a hungry and vicious polar bear was dashed. How could something so darling be so deadly? Neither of them gave off any hint of offensive and I wanted so badly to reach my fingers down and feel their leathery noses. It’s funny how quickly we attach human emotion to something not human. In the very last hour of our very last day, we found her. Our driver, having heard over the radio of another Einstein nearby, was taking us over there for what would likely be our last encounter of the trip. But a solo female was coming straight for us so we decided to stop. It was rare that we would have a bear to ourselves without other buggies around. She was young, 3 to 4 years old our guide guessed, and at first seemed just as curious as the others. She wandered around the back, peered up through the grill, but then suddenly just curled up by the back passenger tire and rested her head on one of her giant paws. And that was it. She just stayed there. She lifted her head every once in awhile if we were a bit too noisy, but otherwise had decided that the perfect spot to nap would be beside us. It seemed a shocking display of trust, and neither our driver or guide quite knew what to make of her. After several minutes of blocking the track, when we had to move to let other buggies by, she followed. We stopped again and she ambled up behind us and took up the same spot by the tire. It was the colder of our two days on the tundra but I could barely be budged off of that open back; I couldn’t take my eyes off of her. It was, in the purest sense of this overused word, the most unbelievable experience with nature I have ever had. Something stirred deep in my soul. Finally, after indulging many moments of silence and awe, we had to leave in order to make our plane. It was agonizing to see her head hung low and with woeful eyes staring up as we drove away. We were all convinced that she was lonely and desperate for our interaction. For our soothing reassurance. For our snuggles. I was not the only one with tears in my eyes as the distance grew between us. But polar bears don’t feel loneliness, we were told. In reality, her only thought would have been one of hunger. And how she was likely many days away yet from satisfying it. 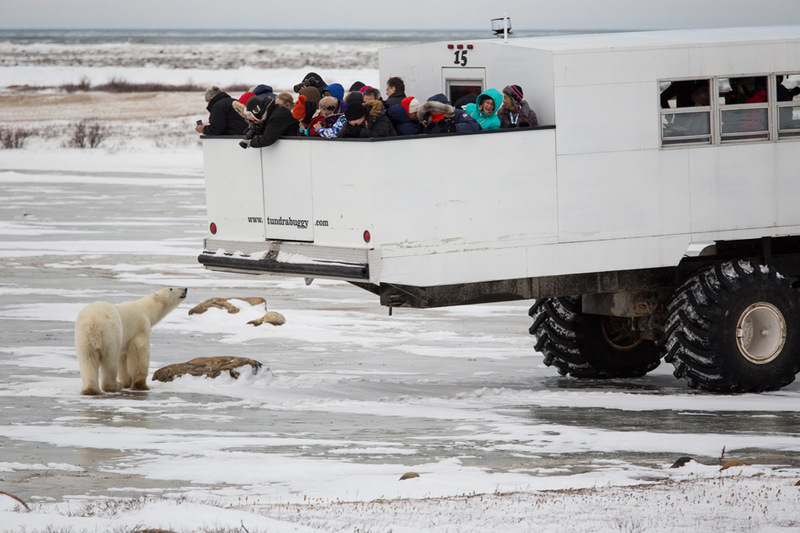 Once again, we have so much appreciation for this excursion with Frontiers North Adventures, which gave us two days on the tundra and two days exploring Churchill. Our time on the buggy of course brought our favourite moments and we were well taken care of during our hours exploring with a well-kept vehicle and plenty of delicious food.For one day on the buggy, we were also accompanied by JoAnne Simerson from Polar Bears International who provided a wealth of information. 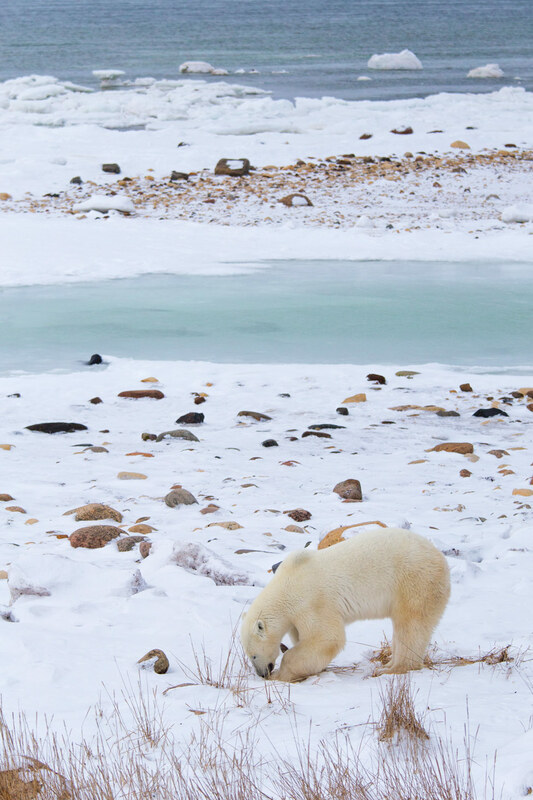 PBI does a lot of work in the area and the world to bring to light the story of the polar bears, including tracking some of the bears that go out onto the Bay (this is our favourite part of their website)! Our trip was courtesy of Travel Manitoba and Frontiers North Adventures. All opinions, as always, are our own. wow! what an amazing experience! 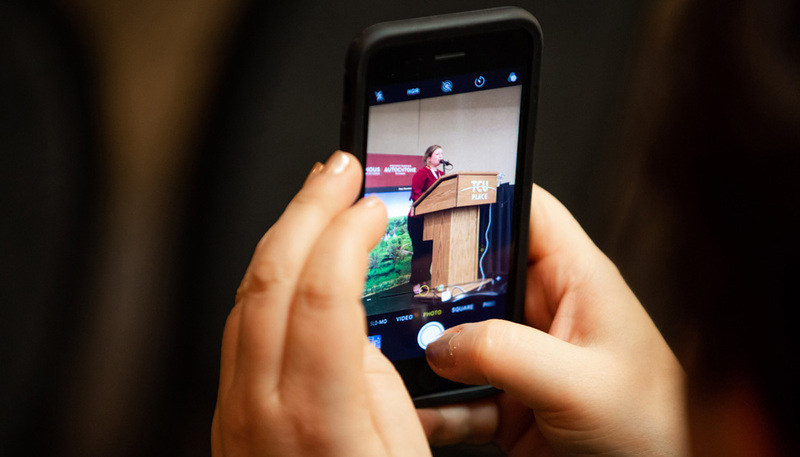 Those photos of the bear up close are wonderful. 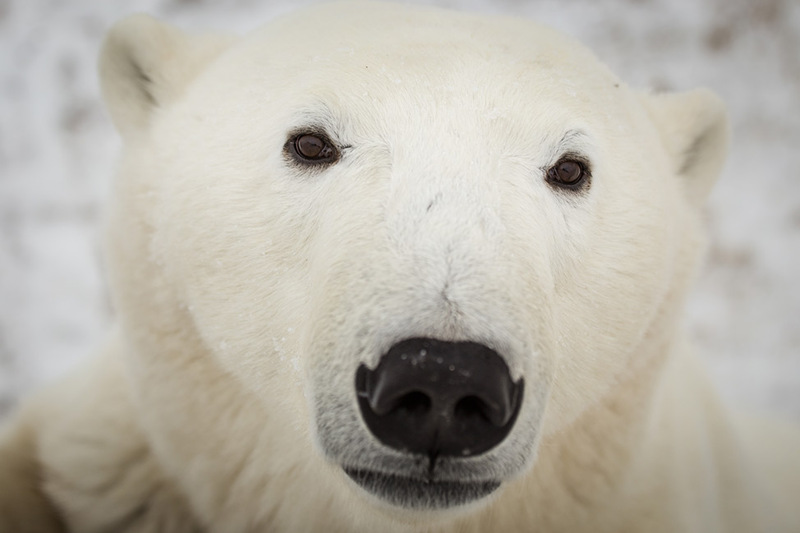 It must have been wonderful to be so close to a polar bear. 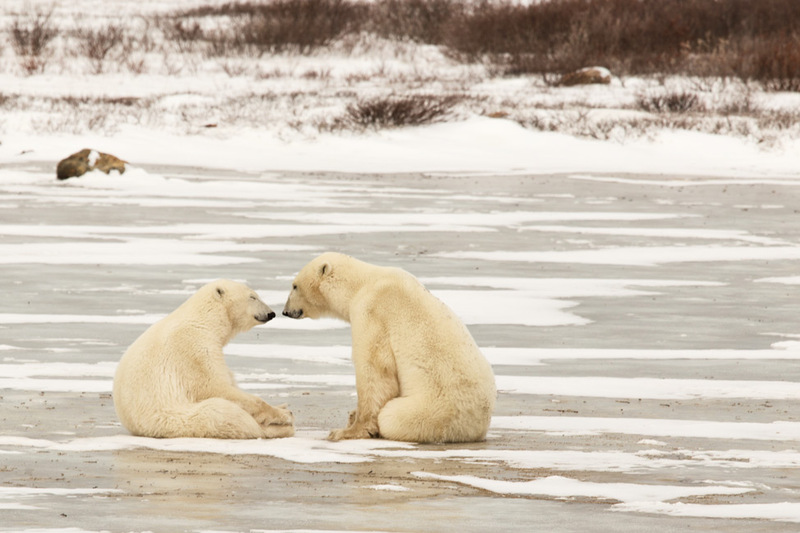 I have never seen photos of polar bears like this – thank you for them and for the chance to experience this through your eyes! i looked at going to churchill whilst in manitoba a few years back and really regret not making it up there. such beautiful creatures. thanks for sharing! Hopefully you can make it back there Megan! VERY worth the trip. You’ve got some really great shots over there! If I were seeing these polar bears in their natural habitat like that in person, I reckon it would be so difficult to resist petting them =’) Very touching entry, thanks for sharing! What a once-in-a-lifetime experience, and so poignant. I, too, would find it tough to leave them behind…and to not want to reach out and touch them. And Pete – wow, what fantastic photos!! Holy. Wow. These photos are beyond. They literally took my breath away. Wow! I think I am going to cry looking at these photos! I absolutely LOVE bears. There is something so human-like about them. The way they stand on two feet, like humans, when they fight. The way they are the most nuturing and delicate parents of all animals – they protect, nurish, and practically raise their cubs. And the way they are so strong and fierce against threats despite having that gentle quality. I truly believe of all animals, the spirit of the bear is the most similar to that of humans. 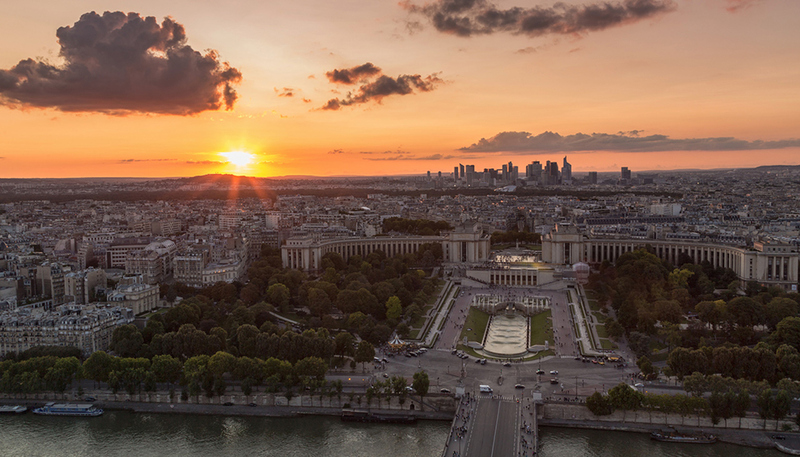 Lost for words… Spectacular! What an incredible experience. Better yet what an inspirational post for all us animal lovers who just found something else that belongs on our bucket lists! Too bad you didn’t give a nod to the driver by name. They are not only skilled as making those HUGE and hodgepodge buggies stay on the road, but position the machines so that passengers can get the best lighting and shots. They do the job for not too much pay, because they WANT to share what they see with you. Some travel across the country every year just to work the bear season. Some are brilliant story tellers, and can tell you as much as scientists. (Or at least in a form you can remember.) They are a tight knit team, but sometimes live for their recognition since FAM trips rarely tip…something to remember when you are on one. Paula, I’m not exactly sure what you are expecting from us here. We aren’t in any way being dismissive of the drivers – of course they play an important role, but we had two different drivers during our time so it was hard to know them well, and thus they just didn’t happen to factor into this narrative story. And as for tipping, please save your judgment. We tip well on all trips when deserving, regardless of it is a FAM or not. Thank you for sharing these absolutely beautiful photos of such majestic creatures!! So sad to think how threatened they are because of climate change and human behaviour. This experience is now firmly on my bucketlist!! 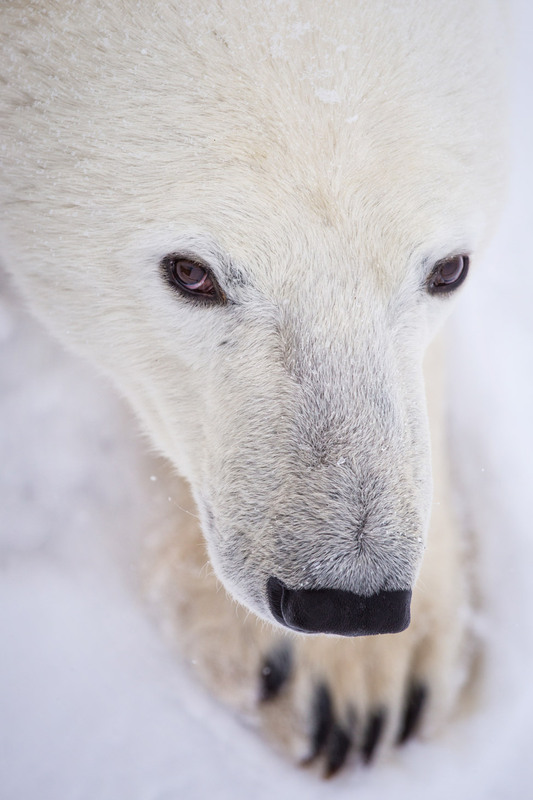 Incredible experience Dalene and these must be the best images of polar bears I’ve ever seen. You have me wanting to head north and take my boys to see these gentle giants. It breaks my heart the way we continue to treat the planet and watch it warm year after year. 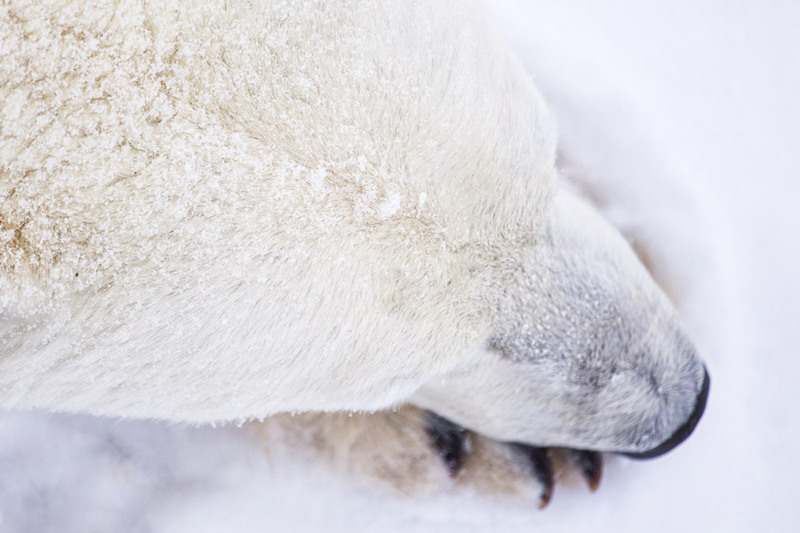 There’s no more emotive a symbol than polar bears struggling with melting ice. Thank you for sharing this amazing trip. Thank you Tracy! I am sure you would all adore such an experience. In our almost seven years on the road, it is one of our most endearing, that is for sure. My eyes are welling up reading this. What an incredible experience! The tension of the male bear approaching the young cubs. The closeness of the female napping by the truck and the look on her face as you pulled away. Simply amazing! Oh my goodness, those pictures are just stunning along with your fabulous words and observations. I would love to do this before they start to disappear in mass. 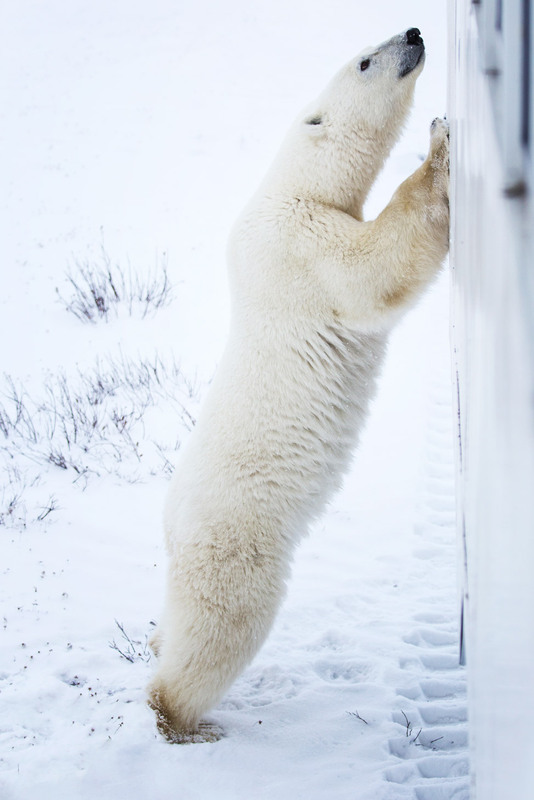 Your polar bear photos keep getting better and better. They are unbelievable. NatGeo has nothing on you two. Simply the best photos I’ve ever seen. Thanks for sharing your story again. I feel like crying after reading about the female bear. Although most of human beings cherish the good of our nature, the minority that holds power and money, is killing everything. It is our sad reality. However, congralutaions for the post. 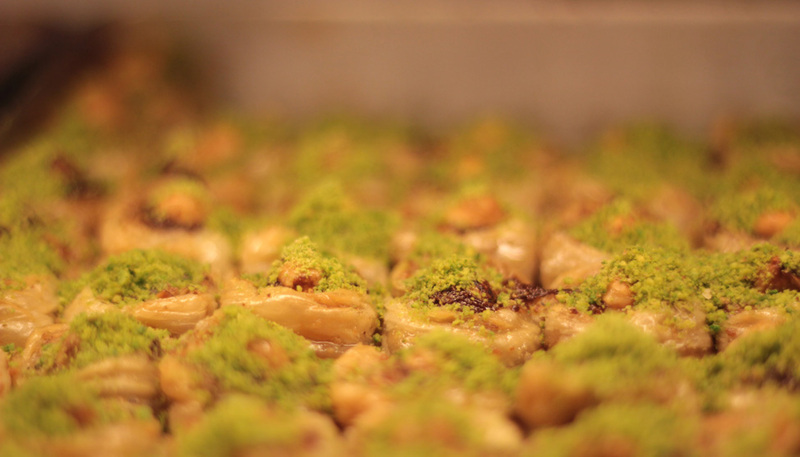 great content and amazing images! My god, Pete – those photos are stunning! And I agree with you, Dalene – I would be hard-pressed to not want to jump down and snuggle with the bears!